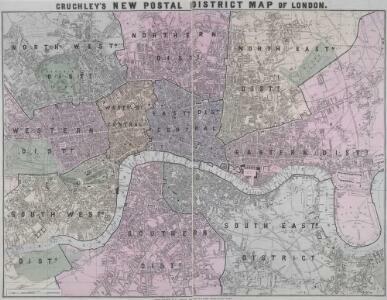 Description: This map shows the division of London into ten post codes. The title appears along the top, with the publisher's imprint below the plan and a scale bar at bottom left. Also on the map are the Metropolitan Railway line to Finsbury, the proposed site of Charing Cross station (built in 1864) and the planned London, Chatham and Dover line.